Brett Luke | The Journal Gazette IPFW's defense goes up to block a spike from Ohio State's Maxime Hervoir during the third set Friday night. 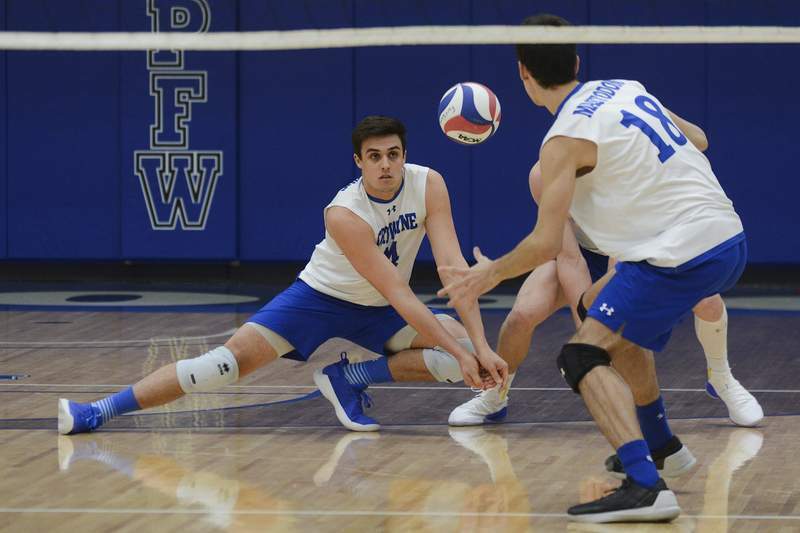 Brett Luke | The Journal Gazette Richie Diedrich of IPFW runs up to spike the ball against Ohio State during the second set at the HIlliard Gates Sports Center Friday night. 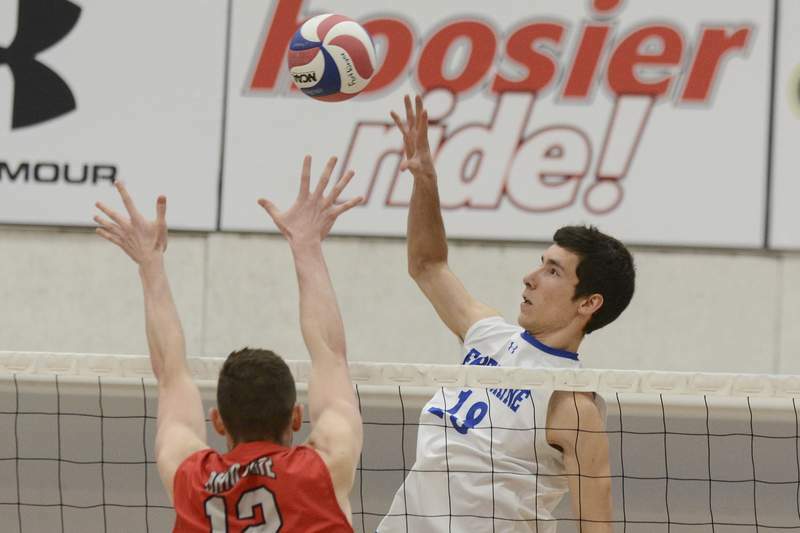 Brett Luke | The Journal Gazette IPFW's Tomas Gago prepares to spike the ball during the third set against Ohio State at the Hilliard Gates Sports Center on Friday. Brett Luke | The Journal Gazette IPFW's Pelegrin Vargas spikes the ball against Ohio State's Blake Leeson during the first set at the Hilliard Gates Sports Center on Friday. Brett Luke | The Journal Gazette IPFW's Pelegrin Vargas digs against Ohio State during the second set at the Hilliard Gates Sports Center on Friday. The learning process continues for the No. 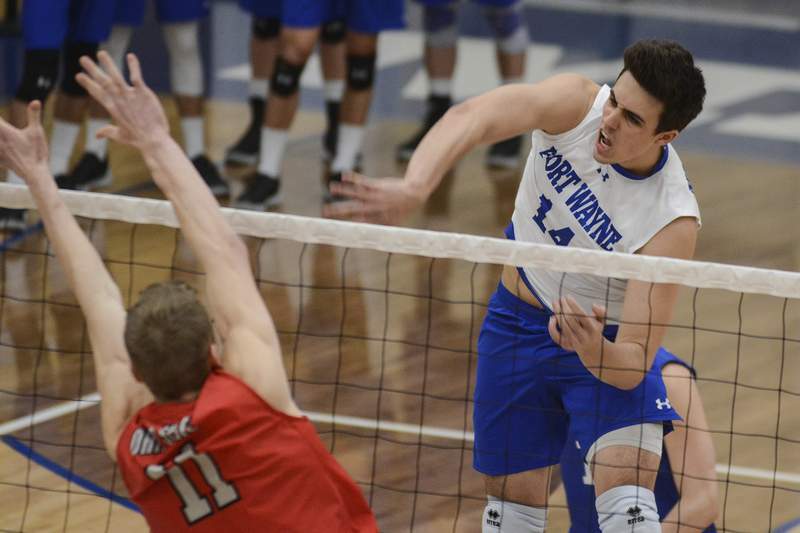 15-ranked IPFW men's volleyball team, which fell 3-0 (25-18, 25-23, 25-16) to No. 7 Ohio State in the penultimate game of the regular season at Gates Center on Friday. The pattern has been the same all year when competing with top-level teams, coach Ryan Perrotte said. In the first set, the Buckeyes (20-4, 11-2 MIVA) led 14-13 but rattled off a 6-2 run to create separation. The Mastodons (17-10, 5-8) led 9-5 early in the second set and stayed within striking distance throughout. “In the second set, we started to pick up and we started serving better,” Pelegrin Vargas said. “That gets the game a little tighter, but in the end, we just couldn't get a ball to end the set. IPFW fought to tie the third set at 10, but Ohio State used 6-1 and 7-1 runs to take a 23-13 lead and, ultimately, the match. 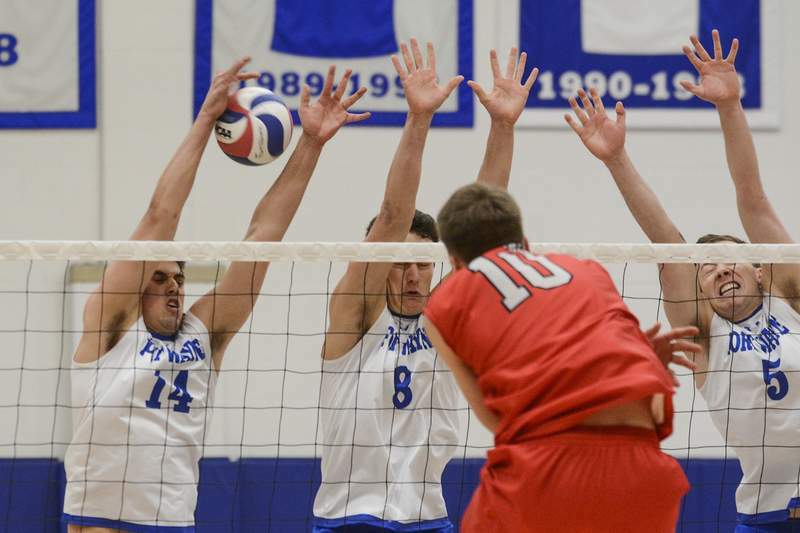 Tony Price, Vargas and Tomas Gago each had eight kills for the Mastodons. 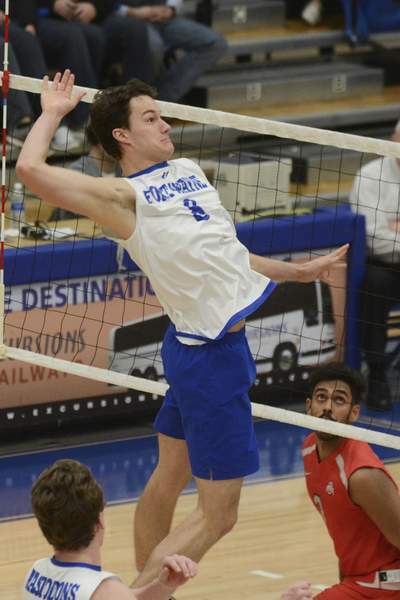 Michael Keegan had 26 assists, and Vargas had seven digs. Maxime Hervoir led the Buckeyes with 16 kills, Jake Hanes had 13 and Szerszen 11. Sanil Thomas had 40 assists and eight digs. Despite the outcome, Perrotte was pleased with the team's tenacity, particularly throughout the longer rallies in the second set. The team will honor senior Jack Carlson before today's match with McKendree. A win would secure IPFW the No. 5 seed for the MIVA tournament.